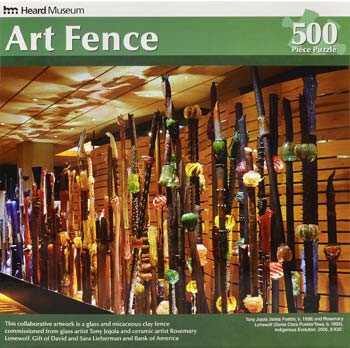 Heard Museum "Art Fence" puzzle This exclusive 500 piece jigsaw puzzle showcases Heard Museum's iconic art installation titled Indigenous Evolution, a collaborative work by glass artist Tony Jojola (Isleta) and ceramic artist Rosemary Lonewolf (Santa Clara/ Tewa). 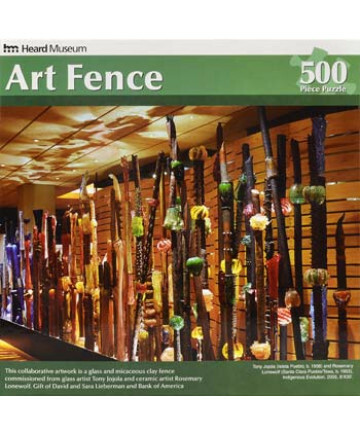 The installation of glass and clay graces the entrance to our Home exhibit and is one of the most popular pieces at our museum. The finished puzzle measures 21 inches by 15 inches.